The T-62A is a Soviet tier 10 medium tank. El desarrollo del primer carro medio soviético de postguerra comenzó en 1951. En 1961, tras desarrollar y probar varios prototipos funcionales, se desplegaron el T-62A con cañón de ánima rayada y el T-62 con cañón de ánima lisa. En marzo de 1962, se abandonó la producción en masa del T-62A. El T-62 se produjo en masa desde 1961 hasta 1975, con un total de 20 000 vehículos fabricados. Las últimas modificaciones todavía están en servicio en algunos países. The T-62A is in some ways a similar tank to its predecessor, the T-54, but at the same time has some significant differences as well. 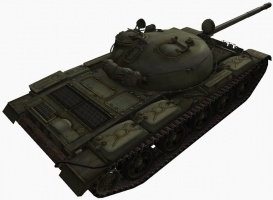 It is not as mobile as the T-54, and has much weaker hull armor, but boasts a hugely more powerful gun, a heavily armored turret, and some of the best gun handling in the game. The T-62A marks the end of its Soviet medium line. Much like the other Soviet medium tanks, the T-62A excels at flanking attacks. However, the 100 mm U-8TS it carries also has excellent penetration, enough to penetrate the weakspots of even the heaviest tanks in the game. 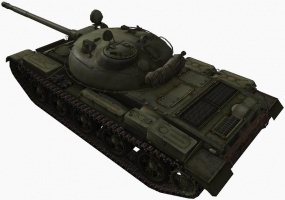 Combined with an incredible rate-of-fire, superb gun handling, high shell velocity, and good base accuracy, the T-62A can quickly rack up the damage despite the low individual shell damage if left unhindered. They also allow the T-62A to make quick and relatively accurate snap shots, and also hit targets while firing on the move with acceptable consistency. Unlike the preceding T-54, the T-62A has a near impenetrable turret, vulnerable to only the biggest tank destroyer guns and premium ammunition. The hull of the T-62A is a completely different story; it is actually weaker than the T-54's, and is easily penetrated by even Tier 8 tanks. To make matters worse, there is a fuel tank situated next to the driver which is very vulnerable to being set on fire. In places where the gun depression allow it to hide the hull of the tank, it can be an incredibly difficult target to destroy. Unfortunately, with only 5 degrees of gun depression, the options for this are fairly limited compared to other medium tanks. 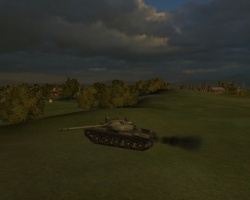 The mobility of the T-62A is quite good, despite the underpowered engine. Its suspension has some of the best terrain resistance values in the game to compensate, although the acceleration can feel a little sluggish compared to the T-54 or the Object 140. The maximum speed is somewhat low, at only 50 km/h, but it is easily good enough to fulfill its role as a medium tank. The T-62A is a highly versatile machine that can perform well in a variety of tasks. It can brawl using its superb rate-of-fire to overwhelm slower firing tanks, has the mobility and penetration to flank more cumbersome opponents, and can even perform as a scout if absolutely necessary, thanks to a good base view range. Flexibility is the T-62A's greatest asset, and it will rarely find itself in a situation where it cannot leverage something in the battle. The T-62A (Obyekt 165) was one of several competing medium tank designs originally intended to replace the older T-54 medium tank. It was designed in 1957 by the Uralvagonzavod design bureau at Nizhniy-Tagil led by Leonid Kartsev. 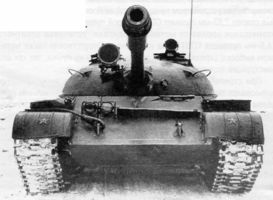 By the end of the 1950s, it had become clear that the 100 mm D-10 gun used on the T-54 was becoming obsolete against the new generation of Western tanks, and a new weapon was designed. This was known as the D-54 (GRAU index: 2A24). It was a powerful 100 mm rifled gun, with comparable performance to the new 105 mm guns appearing on Western tanks. The favored platform for the D-54 was the Kharkov Obyekt 430, the ancestor of the future T-64, designed by Aleksandr Morozov who had also worked on the famous T-34, T-44, and T-54 medium tanks. 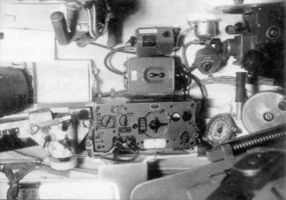 Kartsev had also attempted to fit the D-54 to the T-54 (Obyekt 139) with some modifications, but the T-54 was simply too small to properly service the weapon, while the completely new Obyekt 140 was also intended to use the gun but had run into development problems with the suspension and transmission, and was cancelled. Despite these setbacks, Nizhniy-Tagil continued working on the next-generation medium tank. Nizhniy-Tagil had also designed the Obyekt 150, a missile tank that would eventually enter service as the IT-1 Drakon, which utilized a lengthened hull with T-54 components. This hull would form the basis for the Obyekt 165 and 166, the T-62A and T-62, respectively. At roughly the same time, the Soviet premier Nikita Khrushchev became infatuated with the new smoothbore gun entering service, the 100 mm T-12 (GRAU index: 2A19). He ordered that the new Soviet medium tank would also use the 100 mm T-12 as its main armament. 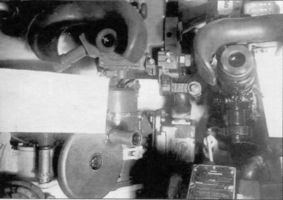 Unfortunately, the gun's long ammunition would not fit in any existing turret, so it was instead proposed that the 100 mm be bored out to 115 mm, allowing for a shorter round that had the same amount of propellant. This gun became the 115 mm U-5 Molot (Hammer; GRAU index: 2A20). Kharkov's Obyekt 430 could not be easily modified to take the new 115 mm smoothbore gun, but Kartsev had already designed a new cast turret for the 115 mm gun that could be fitted to the Obyekt 150 hull. 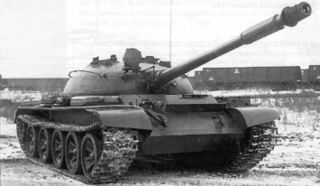 This resulted in the Obyekt 166, which would eventually see widespread service as the T-62, supplementing the T-54/55. The new turret could also fit the D-54 gun, and this combination became the Obyekt 165, entering service as the T-62A. Both tanks were ordered into service in 1961 pending modifications to the Obyekt 430, but it was eventually decided to concentrate on the 115 mm gun instead, and only five T-62As were eventually completed. 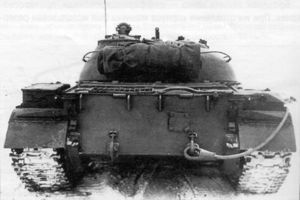 Historically, the T-62 and T-62A had 6 degrees of gun depression while the Object 140 had only 5. This is reversed in the game, possibly for balancing reasons. Zaloga, S.J., 2009, T-62 Main Battle Tank 1965–2005, New Vanguard Series 158, Osprey Publishing, Oxford, 48p, ISBN:9781846033902. Esta página fue modificada por última vez el 25 oct 2016, a las 13:33.